Madagascar periwinkle is cultivated over most of the world, and has become naturalized in almost every tropical and subtropical region. In cooler areas, it is cultivated as an annual or indoor plant (EOL). Naturalized in: Africa: Macaronesia: Spain - Canary Islands Northeast Tropical Africa: Eritrea; Ethiopia South Tropical Africa: Malawi; Mozambique; Zambia Southern Africa: Namibia; South Africa; Swaziland Western Indian Ocean: Mauritius; Reunion; Seychelles Asia-Tropical: Indian Subcontinent: Sri Lanka Indo-China: Thailand Malesia: Malaysia; Papua New Guinea Australasia: Australia: Australia New Zealand: New Zealand - Kermadec Islands Northern America: South-Central U.S.A.: United States - Texas Southeastern U.S.A.: United States - Florida Southern Mexico: Mexico - Chiapas, - Quintana Roo, - Yucatan Southwestern U.S.A.: United States - California Pacific: North-Central Pacific: United States - Hawaii Northwestern Pacific: Marshall Islands; Micronesia; Northern Mariana Islands; U.S. Outlying Islands - Wake Island South-Central Pacific: French Polynesia Southwestern Pacific: American Samoa; Fiji; New Caledonia; Niue; Tonga Southern America: Caribbean: Anguilla; Antigua and Barbuda; Bahamas; Barbados; Cayman Islands; Cuba; Dominica; Dominican Republic; Guadeloupe; Haiti; Jamaica; Martinique; Montserrat; Netherlands Antilles; Puerto Rico; St. Kitts and Nevis; St. Lucia; St. Vincent and Grenadines; Virgin Islands (British); Virgin Islands (U.S.) Mesoamerica: Belize; Costa Rica; El Salvador; Guatemala; Honduras; Nicaragua; Panama Northern South America: Venezuela Southern South America: Argentina; Paraguay; Uruguay Western South America: Bolivia; Ecuador - Galapagos Islands; Peru (GRIN) This species is widely naturalised in northern Australia. It is common in eastern Queensland and also naturalised in the coastal districts of northern New South Wales, in the northern and western parts of Western Australia and in the coastal districts of the Northern Territory. It is also naturalised on Christmas Island and was reported to be naturalised in some parts of southern South Australia in the past (Weeds of Australia Biosecurity Queensland Edition). Widely cultivated, naturalized in tropics, subtropics, often a waif in warm temperate; evidence of naturalization in California lacking (Jepson). Madagascar periwinkle is cultivated over most of the world, and has become naturalized in almost every tropical and subtropical region. In cooler areas, it is cultivated as an annual or indoor plant (EOL). Naturalized in: Africa: Macaronesia: Spain - Canary Islands Northeast Tropical Africa: Eritrea; Ethiopia South Tropical Africa: Malawi; Mozambique; Zambia Southern Africa: Namibia; South Africa; Swaziland Western Indian Ocean: Mauritius; Reunion; Seychelles Asia-Tropical: Indian Subcontinent: Sri Lanka Indo-China: Thailand Malesia: Malaysia; Papua New Guinea Australasia: Australia: Australia New Zealand: New Zealand - Kermadec Islands Northern America: South-Central U.S.A.: United States - Texas Southeastern U.S.A.: United States - Florida Southern Mexico: Mexico - Chiapas, - Quintana Roo, - Yucatan Southwestern U.S.A.: United States - California Pacific: North-Central Pacific: United States - Hawaii Northwestern Pacific: Marshall Islands; Micronesia; Northern Mariana Islands; U.S. Outlying Islands - Wake Island South-Central Pacific: French Polynesia Southwestern Pacific: American Samoa; Fiji; New Caledonia; Niue; Tonga Southern America: Caribbean: Anguilla; Antigua and Barbuda; Bahamas; Barbados; Cayman Islands; Cuba; Dominica; Dominican Republic; Guadeloupe; Haiti; Jamaica; Martinique; Montserrat; Netherlands Antilles; Puerto Rico; St. Kitts and Nevis; St. Lucia; St. Vincent and Grenadines; Virgin Islands (British); Virgin Islands (U.S.) Mesoamerica: Belize; Costa Rica; El Salvador; Guatemala; Honduras; Nicaragua; Panama Northern South America: Venezuela Southern South America: Argentina; Paraguay; Uruguay Western South America: Bolivia; Ecuador - Galapagos Islands; Peru (GRIN) This species is widely naturalised in northern Australia. It is common in eastern Queensland and also naturalised in the coastal districts of northern New South Wales, in the northern and western parts of Western Australia and in the coastal districts of the Northern Territory. It is also naturalised on Christmas Island and was reported to be naturalised in some parts of southern South Australia in the past (Weeds of Australia Biosecurity Queensland Edition). Widely cultivated, naturalized in tropics, subtropics, often a waif in warm temperate; evidence of naturalization in California lacking (Jepson). Many of these regions overlap substantially with California's climate zones (Cal-IPC global map of climate areas matching California). Madagascar periwinkle may prefer sandy soil at low altitudes but is capable of surviving in a variety of tropical and subtropical habitats, including in disturbed areas. It is self-compatible, and has spread from cultivation to become naturalized in many parts of the world. Some therefore consider the plant to be an invasive weed. Although it does readily escape from cultivation, it does not proliferate to the point of overgrowing and wiping out native vegetation in areas where it becomes established, as do seriously invasive plants such as kudzu or Japanese knotweed (EOL). It is so well adapted to growth in Australia, that it is listed as a noxious weed in Western Australia and the Australian Capital Territory, and also in parts of eastern Queensland (Wikipedia). "It is most commonly associated with coastal habitats (e.g. cliff faces, rocky ocean ledges and sand dunes) and other sites with sandy soils, but also grows in bushland and disturbed natural vegetation near urban areas. Pink periwinkle (Catharanthus roseus) is also a problem species in northern Queensland (e.g. it is abundant on Magnetic Island), and is regarded as an environmental weed in New South Wales and Western Australia." (Brisbane City Council Weed Identification Tool). Though commonly found near habitation, this species is also regarded as an environmental weed in New South Wales, Queensland and Western Australia. It is most abundant and troublesome in eastern Queensland. For example, it is abundant on Magnetic Island in northern Queensland and is listed among the 100 most invasive plants in south-eastern Queensland. Pink periwinkle (Catharanthus roseus) is most commonly associated with coastal habitats (e.g. cliff faces, rocky ocean ledges and sand dunes) and other sites with sandy soils, but also grows in bushland and disturbed natural vegetation near urban areas (Weeds of Australia Biosecurity Queensland Edition). Catharanthus roseus is invasive in parts of Kenya (BioNET-EAFRINET Invasive Plants Keys and Fact Sheets). Brisbane City Council (0). Brisbane City Council Weed Identification Tool. East African Network for Taxonomy (2011). BioNET-EAFRINET Invasive Plants Keys and Fact Sheets. Madagascar periwinkle may prefer sandy soil at low altitudes but is capable of surviving in a variety of tropical and subtropical habitats, including in disturbed areas. It is self-compatible, and has spread from cultivation to become naturalized in many parts of the world. Some therefore consider the plant to be an invasive weed. Although it does readily escape from cultivation, it does not proliferate to the point of overgrowing and wiping out native vegetation in areas where it becomes established, as do seriously invasive plants such as kudzu or Japanese knotweed (EOL). It is so well adapted to growth in Australia, that it is listed as a noxious weed in Western Australia and the Australian Capital Territory, and also in parts of eastern Queensland (Wikipedia). "It is most commonly associated with coastal habitats (e.g. cliff faces, rocky ocean ledges and sand dunes) and other sites with sandy soils, but also grows in bushland and disturbed natural vegetation near urban areas. Pink periwinkle (Catharanthus roseus) is also a problem species in northern Queensland (e.g. it is abundant on Magnetic Island), and is regarded as an environmental weed in New South Wales and Western Australia." (Brisbane City Council Weed Identification Tool). Though commonly found near habitation, this species is also regarded as an environmental weed in New South Wales, Queensland and Western Australia. It is most abundant and troublesome in eastern Queensland. For example, it is abundant on Magnetic Island in northern Queensland and is listed among the 100 most invasive plants in south-eastern Queensland. Pink periwinkle (Catharanthus roseus) is most commonly associated with coastal habitats (e.g. cliff faces, rocky ocean ledges and sand dunes) and other sites with sandy soils, but also grows in bushland and disturbed natural vegetation near urban areas (Weeds of Australia Biosecurity Queensland Edition). Catharanthus roseus is invasive in parts of Kenya (BioNET-EAFRINET Invasive Plants Keys and Fact Sheets). Many of these regions overlap substantially with California's climate zones (Cal-IPC global map of climate areas matching California). It was formerly classified in the Vinca genus as Vinca rosea (EOL). Vinca major is a weedy congener in California (Cal-IPC; UC IPM). Native to Madagascar; introduced into many temperate and tropical areas on various continents and islands worldwide. 0-1000 m elevation. As an ornamental plant, it is appreciated for its hardiness in dry and nutritionally deficient conditions, popular in subtropical gardens where temperatures never fall below 5 °C to 7 °C, and as a warm-season bedding plant in temperate gardens (EOL). Does best in Zones 9a-11 (Dave's Garden). Located throughout most of the world, with over 1300 records on GBIF alone; mostly in southern hemisphere and southern portion of northern hemisphere (GBIF). Most of these regions overlap substantially with California's climate zones (Cal-IPC global map of climate areas matching California). Although it does readily escape from cultivation, it does not proliferate to the point of overgrowing and wiping out native vegetation in areas where it becomes established, as do seriously invasive plants such as kudzu or Japanese knotweed (EOL). As a consequence, Madagascar periwinkle is sometimes considered to be an invasive weed, although it does not normally proliferate sufficiently to eliminate native vegetation (KEW). An exhaustive Google/Google Scholar search did not reveal any additional strong evidence of this and this defaults to a “no” answer at this time. [Anonymous] (2014). Kew Royal Botanical Gardens. An exhaustive Google/Google Scholar search did not reveal any evidence and this defaults to a “no” answer at this time. It is a relatively fleshy, evergreen subshrub, so unlikely. Madagascar periwinkle contains a large number of toxic alkaloids, the best known of which are vincristine and vinblastine. Animals consuming large amounts of Madagascar periwinkle while grazing have been observed to suffer from hypotension, neurotoxicity, anemia, seizures, and death. No specific treatments are known; Burrows and Tyrl (2001) recommend supportive treatment including sedation and, if appropriate, activated charcoal. Traditional human medicinal uses of Madagascar periwinkle do not cause similar toxicity, apparently because the quantities consumed are too small to provide a lethal dose of the toxic alkaloids (EOL). As with other members of the Apocynaceae family, the sap is extremely toxic (KEW). Madagascar periwinkle is poisonous if ingested or smoked. It has caused poisoning in grazing animals. 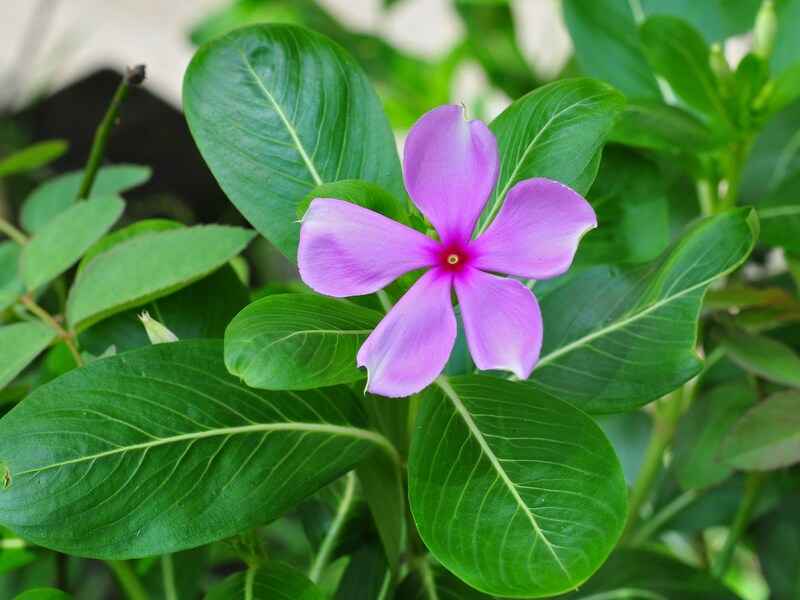 Even under a doctor's supervision for cancer treatment, products from Madagascar periwinkle produce undesirable side effects (Floridata). Perennial subshrub, woody at base, 30-60 cm tall, young branches pubescent (EOL). An exhaustive Google/Google Scholar search did not reveal any additional evidence of this and it defaults to a “no” answer at this time. Unlikely based on size of plant. Propagated by seed. Plants may also be propagated by cuttings (EOL). Madagascar periwinkle is easy to cultivate, and can be propagated by seed or by cuttings (KEW). Horticultural propagations do not warrant a yes for this question, and an exhaustive Google/Google Scholar search did not reveal any evidence of this and it defaults to a “no” answer at this time. Plants may also be propagated by cuttings (EOL). Madagascar periwinkle is easy to cultivate, and can be propagated by seed or by cuttings (KEW). Horticultural propagations do not warrant a yes for this question, it is unlikely to fragment easily, and an exhaustive Google/Google Scholar search did not reveal any evidence of this and it defaults to a “no” answer at this time. Plant germinates readily from seed (EOL). Madagascar periwinkle is easy to cultivate, and can be propagated by seed or by cuttings (KEW). Propagated by seed (Dave's Garden). There are about 21,000 seeds per ounce, depending on the cultivar (Greenhouse Production of Annual Vinca), but no information was found on ounces of seed produced per plant, and this remains unanswered at this time. Alabama A&M University, Auburn University (1998). Greenhouse Production of Annual Vinca. Plant germinates readily from seed. Snoeijer (1996) found that seed germination is improved by covering a pot with plastic for increased humidity, sowing the seeds on top of the soil, and exposing them to light; however, other authorities favor germination in the dark (EOL). Gogitidze (1983) reported 85-95% of freshly harvested seeds germinated after 2 days and they retained high germinability for two subsequent years (PIER). Is treated as an annual often, flowers within first year (Greenhouse Production of Annual Vinca). Fruiting throughout the year. It is noted for its long flowering period, throughout the year in tropical conditions, and from spring to late autumn, in warm temperate climates (EOL). Flowers Summer in California (Jepson). California has long summers, and this is a "yes". Its seeds have been seen to be distributed by ants (KEW). These seeds are spread by water, wind and in dumped garden waste. They may also be dispersed by animals, vehicles, and in contaminated soil (Brisbane City Council Weed Identification Tool). However, an exhaustive Google/Google Scholar search did not reveal any additional evidence, there are no morphological adaptations for dispersal by animals, and ants will not likely distribute 100 m or more, and it defaults to a “no” answer at this time. These seeds are spread by water, wind and in dumped garden waste. They may also be dispersed by animals, vehicles, and in contaminated soil (Brisbane City Council Weed Identification Tool). An exhaustive Google/Google Scholar search did not reveal any additional evidence of this, and there are no obvious morphological adaptations for wind or water dispersal, and it defaults to a “no” answer at this time. These seeds are spread by water, wind and in dumped garden waste. They may also be dispersed by animals, vehicles, and in contaminated soil (Brisbane City Council Weed Identification Tool). An exhaustive Google/Google Scholar search did not reveal any additional evidence of this, and there are no obvious morphological adaptations for this type of dispersal, and it defaults to a “no” answer at this time. Reviewed by Irina Irvine and Gina Darin.